Failure to include children in national disaster plans may lead to children receiving lower quality urgent and life-sustaining care, and potentially compromising their outcome. Despite potential victims of mass casualty incidents can include children, efforts made to improve organisation and management of multiple victims mainly focus on adult patients. In both prehospital and hospital settings, paediatric preparedness is very heterogeneous between the French centres. A national programme must be defined and guidelines generated. In the last 3 years, several terrorist attacks occurred in Europe resulting in hundreds of deaths and injured people.1 2 Attacks took place in Barcelona, Paris, Nice, London, Berlin, Stockholm and Brussels. Following these attacks, the French Ministry of Health focused efforts to improve the management plan for mass attack contingencies in France.3 The Emergency Plan, ORSAN-AMAVI (ie, Organisation de la Réponse du Système de Santé en Situations Sanitaires Exceptionnelles-Afflux Massif de Victimes), was developed and organised to ensure national coordination of the healthcare system in the case of a natural disaster or major trauma mass casualty. As with any disaster, potential victims can include children (Nice, 14 July 2016), the proportion of which often depends on the type of event, location and time of day.2 Importantly, children have anatomic and physiologic characteristics that make them different from adults, requiring specialised care with paediatric staffing and resources.4 5 However, efforts made to improve organisation and management of victims mainly focus on adult patients and AMAVI does not include any paediatric consideration. Despite realising that most trauma centres have a limited ability to manage multiple paediatric victims, no specific procedures or training objectives were implemented for children.1 Failure to include children in national disaster plans may lead to children receiving lower quality urgent and life-sustaining care, and potentially compromising their outcome. To address this issue, we aimed to determine paediatric hospital preparedness for a mass casualty disaster involving children in both prehospital and hospital settings. The study findings will serve to generate recommendations, guidelines and training objectives. The AMAVI-PED study is a cross-sectional survey conducted by the Groupe Francophone de Réanimation et Urgences Pédiatriques (GFRUP) to evaluate paediatric preparedness of French paediatric hospitals. In September and October 2017, a questionnaire containing 47 closed questions was distributed to secondary and tertiary hospitals via the GFRUP’s mailing list, asking for one response per site. The electronic questionnaire (Google Form; Mountain View, California, USA) was sent to physicians with key roles in specialised paediatric acute care, including: the paediatric emergency department (ED), the paediatric intensive care unit (ICU) and the paediatric mobile ICU recruited among members of the GFRUP. We only included questionnaires from physicians working in paediatric centres, as defined by a hospital with a dedicated paediatric ED. The questionnaire was validated by a group of three paediatric disaster management specialists who were not involved in the study. It contained two sections: (1) hospital organisational procedures and facilities, including prehospital care and (2) level of preparedness with regard to paediatric disaster. The questionnaire focused on demographics (location, setting, hospital/university based), organisation of the paediatric specialised mobile ICU, management of patients with paediatric trauma (location, team leader, hospital facilities), training (didactic training and exercises) and organisational procedures in case of a disaster. Questions were multiple choice and scores were measured on a 0–10 scale (10 meaning fully prepared). The option to include free text was added at the end of the questionnaire. The link to the survey was accompanied by instructions to facilitate answering to the questionnaire. In order to reach an 80% response rate at tertiary teaching hospitals, reminder e-mails were sent to non-responding units. If more than one questionnaire per centre was completed, data were compared and in case of disagreement, clarifications were requested in an individual e-mail to the head of the paediatric ED. We hypothesise that larger paediatric centres are better prepared to handle mass casualties, with better human resources available and paediatric mobile ICU. A priori, we defined bigger centres when the number of paediatric beds was superior to the 50th percentile of the entire cohort. Data were expressed as median values (with IQRs) for continuous variables, and number and/or frequency (%) for binary or categorical data. All statistical tests for binary or categorical variables were performed using χ2 or Fisher’s exact test where appropriate, whereas continuous variables were compared with the paired t-test. All p values <0.05 were considered as significant. Statistical analyses were performed using SPSS V.24.0 (SPSS). A total of 43 questionnaires from 31 centres were completed. Three centres were excluded because they did not come from a French paediatric centre; 28 were therefore available for analysis. Overall, 26 (93%) centres were tertiary teaching hospitals and two (7%) were non-academic hospitals (figure 1). The median number of paediatric beds among the centres was 155 (IQR: 119–209). In total, 81% (26 of 32) of French University Hospitals were represented in the study. Thirteen (46%) responders were physicians from the paediatric ED, 12 (43%) were from the paediatric ICU and 3 (11%) were from paediatric mobile ICU. Seven (25%) physicians also practised in the paediatric prehospital care. 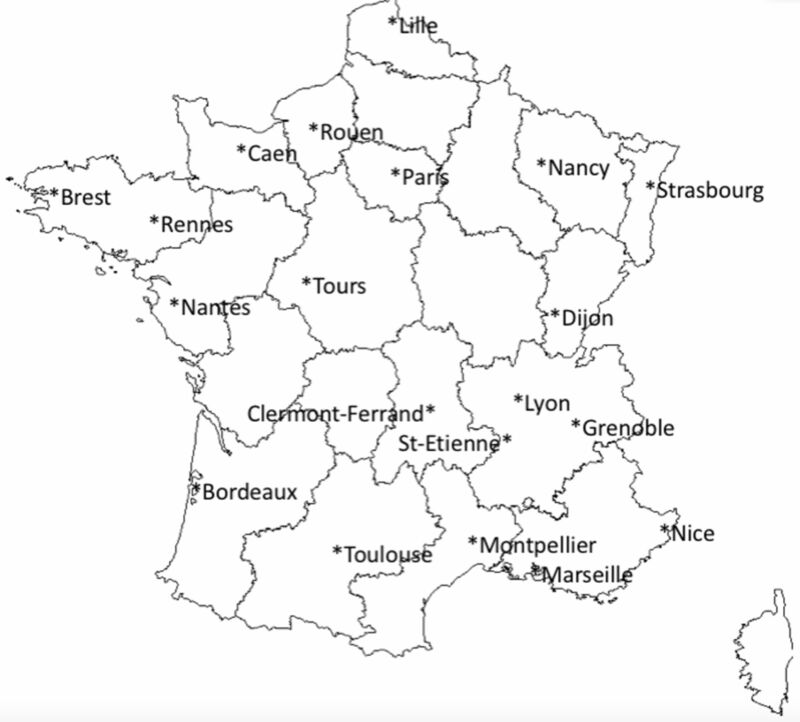 Distribution of participating centres across France. A disaster plan AMAVI with a specific paediatric emphasis was established in all the paediatric centres (n=27, 96%) excluding the one which did not admit patients with trauma. In case of a mass casualty event, paediatric victims would be initially admitted to the paediatric ED for most centres (n=21; 75%), with some admitting initially to the paediatric ICU (n=3; 11%) or the adult ED (n=3; 11%). Table 1 shows the disaster preparedness of paediatric care centres. Sixteen (57%) centres have already experienced a mass casualty event in the last 20 years, and this was not significantly associated with training implementation. Didactic teaching and simulation exercises were implemented in 20 (71%) and 22 (79%) centres, respectively. The topics covered in teaching sessions are illustrated in figure 2. In hospitals having an established disaster plan, a referring physician for AMAVI plan was identified in 20 (74%) cases. Overall, physician participants rated the level of readiness of their hospital as 6 (IQR: 5–7) on a 10-point readiness scale. The median score for self-estimated capability of participants to cope with a disaster situation including paediatric patients was 5 (IQR 4–6). The proportion of hospital centres with various trauma topics in their trauma teaching programmes (didactic teaching in dark grey and simulation exercise in light grey). One hospital did not admit patients with trauma. In others, paediatric patients with trauma were all admitted and managed in the trauma resuscitation room, most often located in the paediatric ED (n=10; 37%) (figure 3). In half of the hospitals, the leader of the trauma team was either the paediatric intensive care physician (n=7; 26%) or the emergency care physician (n=7; 26%) (figure 3). Paediatric anaesthesiologists, paediatric surgeons and paediatric radiologists were in-house in 20 (71%), 5 (18%) and 12 (43%) centres, respectively (table 1). An on-site CT scan and MRI were available 24/7 in 25 (89%) and 18 (64%) centres, respectively. Local organisation for management of patients with trauma: provision of trauma team leader (A) and location of initial trauma resuscitation room (B). ED, emergency department; ICU, intensive care unit. Twenty-three (82%) hospitals had a paediatric specialised mobile ICU. Seven (25%) of these could provide a prehospital emergency response, with the maximum age limit for intensive care transport being 4 years (IQR: 2–15). Characteristics of paediatric specialised mobile ICU are detailed in table 2. In this study, we highlight important findings about the readiness of paediatric centres for a mass casualty event involving children. To our knowledge, this is the first study that focused on both hospital organisation, prehospital and in-hospital management of paediatric patients and provider level of training. It is important that healthcare professionals who care for acutely ill children should be aware of the local procedure for paediatric mass casualty, including the roles and the responsibilities of each provider. To reach this goal, training is probably the best tool. The goal should be that children in mass casualties be managed with the same level of care as a non-disaster situation. Overall, we found that all the paediatric centres that admit patients with trauma have an AMAVI disaster plan, with an established paediatric component. However, we demonstrated heterogeneity in healthcare organisation and healthcare provider training in their ability to deal with a large number of paediatric victims. Management of mass casualty events is a major public health concern since disasters can affect any country worldwide. In France, the ORSAN Emergency Plan, created in 2014, forms part of French civil contingency legislation (similar to other countries) and covers five subplans6: (1) AMAVI, in case of a mass attack; (2) CLIM (Risque climatique), to deal with climate-related disasters; (3) EPIVAC (Risque épidémique), in case of an epidemic event; (4) BIO (Risque biologique), in case of biological event; and (5) NRC (Risque nucléaire/chimique), in case of nuclear, chemical or radiological threat. The ORSAN plan is a procedure for preparedness, designed to optimise patient pathways and management, and to provide resources to the healthcare system to deal with the different types of events. Local implementation of the ORSAN procedure is outlined for each hospital according to its facilities and location within the Plan Blanc (disaster plan). The AMAVI plan was activated in November 2015 in Paris and July 2016 in Nice, after terrorist attacks.1 3 The Nice attacks occurred during the Bastille Day fireworks and children were among the victims of this tragic event. Some children received prehospital medical support prior to transfer to a paediatric hospital, while others arrived at the hospital independently. The disaster plan (ie, Plan Blanc) was activated and local healthcare providers commendably managed 44 patients, including 32 children at the Children’s Hospital.2 These events demonstrated that every paediatrician can be faced with disaster victims. Despite the care provided in the above example, the AMAVI plan does not include specific paediatric considerations. We have showed, however, that most paediatric centres developed a plan for a local disaster procedure, which is fortunately higher than previous studies conducted in other countries.7 8 Due to the lack of national guidelines regarding management of paediatric victims in case of a disaster, each centre had to develop its own procedure according to their local organisation and infrastructure. Given that management of patients with trauma is greatly heterogeneous between centres, in both prehospital and in-hospital settings, paediatric readiness consequently differs across the country. As supported by the moderate self-estimated readiness scores (6/10 and 5/10 for the hospital and individual readiness, respectively), some aspects of preparedness are missing, specifically with regard to training. The management of patients with trauma in France and in some European countries differs compared with North America. There are recommendations in France to transfer trauma cases to a reference centre with extensive experience, usually a university hospital.9 This study found wide variations in organisational practices, from age limit, to choice of team leader and location of the resuscitation room. 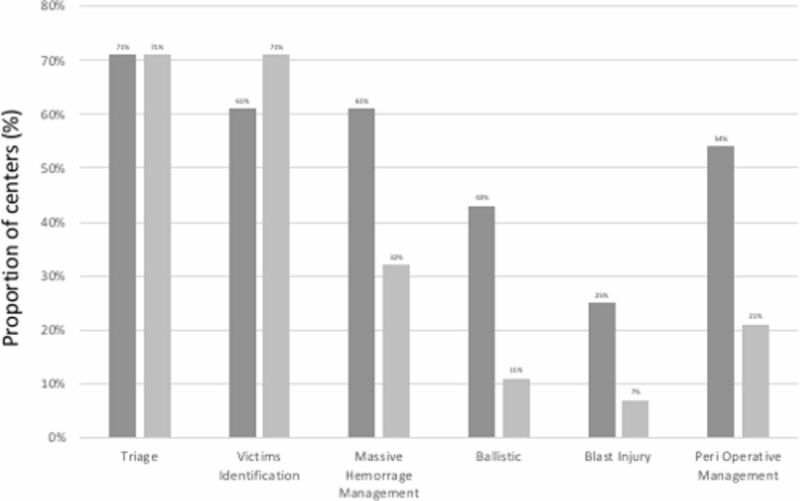 Javouhey et al previously described heterogeneity in the management of severely injured children in road accidents,9 likely explained by the absence of organisation and paediatric trauma centre qualifications in France. Consistent with this study, we found that children with severe trauma are managed by adult physicians in more than one-third of hospitals, although adult physicians may be uncomfortable, or unexperienced with younger patients and infants. Furthermore, some paediatricians may be less familiar with trauma in adolescents, for whom the management is similar to adult patients. Importantly, paediatricians have limited exposure to patients with trauma, given that older children seen in larger centres account for the major proportion of patients with trauma.9 10 In those centres, collaboration with trauma-trained adult intensivists should be encouraged. Both adult and paediatric emergency and intensive care training programmes lack in formal education and management of patients with paediatric trauma, and therefore recommendations for improvements in training, including simulation, are highly needed. In addition, due to the limited resource capacity of paediatric centres, adult trauma centres must be included in the organisation for mass casualty event preparedness involving children. Paediatric disaster readiness therefore requires good collaboration between paediatric centres, adult trauma centres and prehospital emergency medical services. We found that 82% of centres have a paediatric specialised mobile ICU. These findings confirm data from a previous study published in 2011 by Naud and Chabernaud.11 Variability remains in the mobile ICU type of missions, service availability and age limit of patients managed. This may be explained by training of age-specific groups for both neonatologists and paediatricians, by the diversity of healthcare organisation in the different areas (population density, number of paediatric centres) and by the level of intervention required. Given the importance of prehospital medical services for patients with paediatric trauma, harmonisation of paediatric transport and prehospital care across the country are urgently needed. We assessed that three-quarters of paediatric centres have implemented a training programme in disaster management. Given that healthcare providers are rarely exposed to mass casualty events, training is crucial to preparedness. Simulation has been demonstrated to be a reliable tool to improve training of healthcare workers to respond to a disaster,12–14 since it offers greater and longer lasting learning experience than other didactic methods. The use of high-fidelity simulators or live actors as patients is preferred, as they provide more realistic scenarios with real-time stressors. Such experiential learning may be improved with simultaneous traditional didactic methods.15 Training should focus on several aspects such as triage, patient identification, damage control surgery, specific traumatic pathology and communication. Importantly, we found that only a few physicians in each centre were trained in trauma, despite that most of them would be required in case of a disaster. In addition, teaching sessions focused on triage and identification of victims, and we observed a lack of training regarding specific disorders encountered in disasters.13 To improve paediatric disaster readiness and implication of healthcare professionals, paediatric victims should be included in simulation scenarios, teaching objectives should be refined and methods broadened along with harmonisation across centres. Our study has several limitations that should be highlighted. First, we only included French hospitals and this leads to a relatively small sample. Second, since healthcare organisation and regulations vary greatly between countries, the generalisability of our study is likely limited. Third, the self-response survey may predispose to selection bias of participating individuals who may have overestimated the level of readiness. Participants from care centres who do not consider themselves or the centre well prepared for disaster may have elected not to complete the questionnaire. Finally, our results were not representative of average hospitals since most of participating hospitals were tertiary care centres. That being said, the high density of population in France means most of paediatric patients can be transported to a paediatric centre in less than 1 hour, and other hospitals would not necessarily be involved. Although most of French hospitals have a disaster plan, paediatric preparedness is very heterogeneous between the centres. Only a few healthcare providers are well trained to deal with children in case of a mass casualty event. Based on the study findings, we suggest that a national programme must be defined and guidelines generated. To enhance hospitals and healthcare providers’ readiness for disasters involving children, training must be improved and plans tested in simulation exercise on a regular basis, both in the prehospital and in-hospital setting, with various scenarios. Guidelines should place strong focus on communication and coordination between professionals and hospital facilities. From an organisational point of view, adult trauma centres and prehospital emergency medical service should be included in the programme development because they would play an important role in a mass casualty event involving children. Moreover, to facilitate the implementation of disaster plans such as AMAVI, organisational practices regarding prehospital and in-hospital management of patients with paediatric trauma should be harmonised.
. Aide à l’oragnisation de l’offre de soins en situations sanitaires exceptionnelles. In: MdAsdlSedDd femmes , ed, 2014.
. Training medical staff for pediatric disaster victims: a comparison of different teaching methods. Am J Disaster Med 2008;3:189–99.